Minneapolis, MN – Unicorn Riot walked through the Franklin/Hiawatha Encampment on August 17, 2018. The encampment, or “wall of forgotten natives“, is a tent city of houseless folks, mostly of Native American descent, that’s popped up along the Hiawatha highway noise barrier. We walked and talked with James Cross, co-founder of Natives Against Heroin, and interviewed him and others about what needed to be done. Franklin/Hiawatha Encampment the “Wall of Forgotten Natives.” from Unicorn Riot on Vimeo. The other obstacles houseless folks face, Cross said, are things like losing their identification, warrants, and felonies that may stop them from getting help from public programs and services. James Cross of Natives Against Heroin explains why him and others are at the houseless encampment. Cross said, “we know they are all here. So that’s why we’re providing these services today.” He explained how the encampment was a perfect opportunity, pointing to the various Indian health groups and social services groups trying to conduct interviews with camp residents. As we walked through the camp, James told us that problems around homelessness and addiction had already been happening and that now it was out in the open. He also felt the city had already proved it could house everyone when Super Bowl 52 came into town. After the Super Bowl, Cross told us, city officials just let everyone back onto the street and stopped housing them. 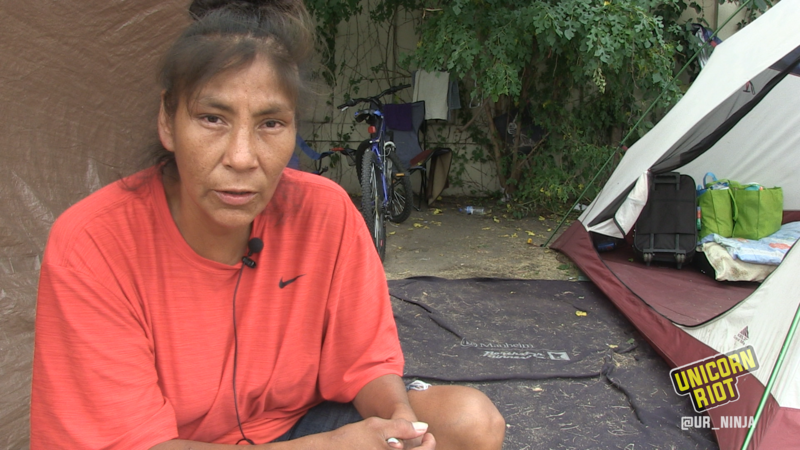 We spoke to Angie Martin, a resident at the tent city, who said, “they really need help on housing, that the housing thing was the hard part.” She said she felt safer living in the camp with many others present, but also worried that other people may be coming to camp for different reasons than hers. Angie Martin in front of the the tent she calls home. For Angie Martin, it was about being able to set up a tent and not be told to move. It gave her a place to rest and de-stress during the day. She also was able to spend time with her family in the tent and it gave them somewhere to go to be together. She explained she didn’t have enough money for a rental deposit, and couldn’t get through the background and credit checks to get housing. 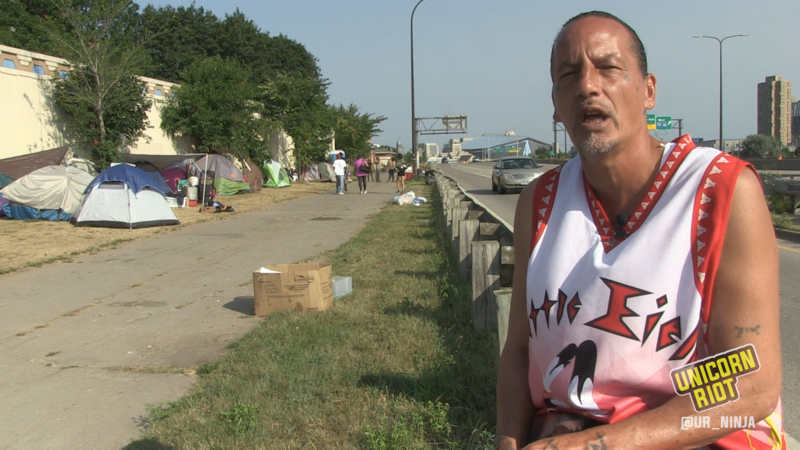 James Weldon, another resident of the tent city, said not being able to afford housing “doesn’t make us any different,” even though he has his struggle with addiction, emotions and regrets, Weldon said, “I still have love and respect for all my people. And all relations.” We left Josh Weldon and he went back to raking the yard around his tent. James Weldon takes a break from raking to smudge. We also spoke to Rosemary with Southside Harm Reduction. Rosemary explained that harm reduction was meeting people where they were at to attain the type of wellness they needed. Rosemary also explained that while heroin, methamphetamine, and other drugs have plagued the local neighborhood, the overdose crisis was driven by Fentanyl, a synthetic opioid that has flooded the market and is now found in a wide array of street drugs. Rosemary explained that a lot of deaths come from people not knowing what’s in their drugs. 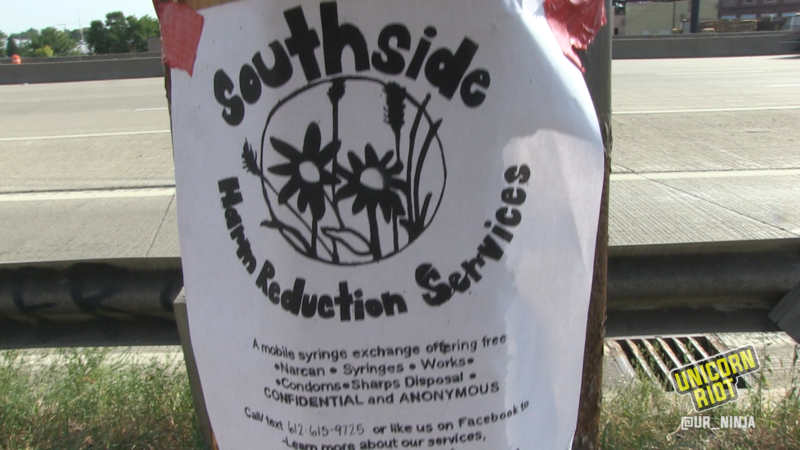 Rosemary told us that the biggest form of harm reduction was “housing people with dignity.” Southside Harm Reduction offered Fentanyl testing strips and clean injection supplies. From what we learned, they hoped to make sure people didn’t die from the wide array of dangers associated with injection drug use, and provided information and supplies to have a better chance at staying alive and being able to seek addiction help when they were ready. 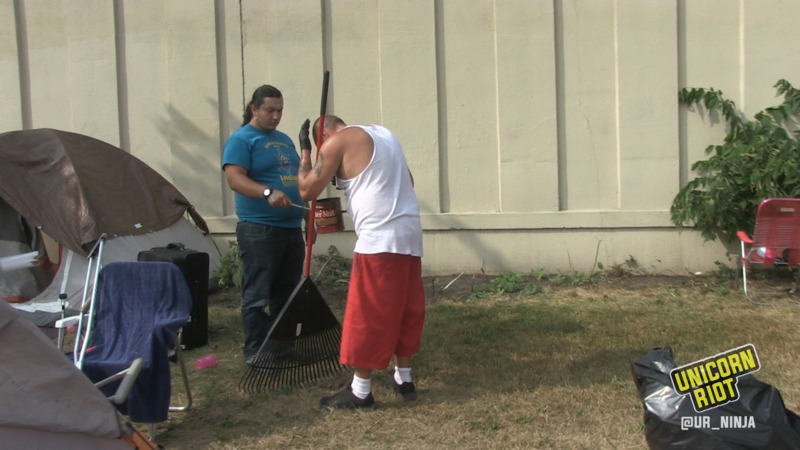 The city plans to clear the Franklin/Hiawatha encampment by the end of September and continues to focus on the dangers of living outdoors in a city. The people we talked to at the encampment didn’t focus on the dangers associated with living while houseless in a large metropolitan area, but on the ability to be able to go somewhere to lay down and rest. Advocates for houseless folks also spoke about the camp providing an opportunity to provide services to people who usually fall through cracks of the system. For James Cross of Natives Against Heroin, it was about helping Native American people and letting them know they’re not forgotten.